The Infiniti 300 has an external control that allows for a more robust implementation when used in higher, more permanent type applications. Typical applications utilize a more permanent tower structure greater than 30 feet in height requiring longer wire lengths between the wind turbine charger and batteries. Solar Power Mart’s Infinite Series of small wind turbines provide battery charging capability in remote off-grid applications. The Infiniti 300 is small, efficient, and operates in winds from 3 to 20 m/s. The units are maintenance free, have only two moving parts and offer a three-year warranty. The Infiniti 300 Turbines are compact but provide maximum power output with highly efficient blades, controller and alternator. In order to best harness wind energy, the Infiniti 300 Turbines maintain a steady charging current, effectively protecting the battery. Reliable Hystersis Braking allows the turbines to slow down in strong winds and shut down completely in winds over 20 m/s. Higher earnings at a lower wind speed. Is this possible? Yes, is the answer of this question. 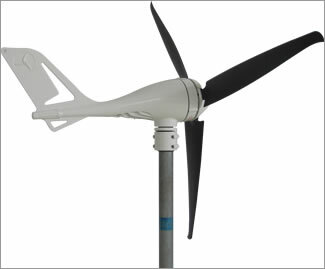 Not the maximum power of a wind turbine is important for you as a customer but the earnings of the wind generator are. Most time of the year the wind blows with an average wind speed of 4-5 m / s, that's why the new Infiniti 300 was optimized for these wind speeds. Thanks to its modern blade design and the intelligent electronic the Infiniti 300 is already running at 3 m / s and loads the battery starting at 2.5 m / s. The Infiniti 300 is extremely robust due to its carbon Fibreglass Blades. 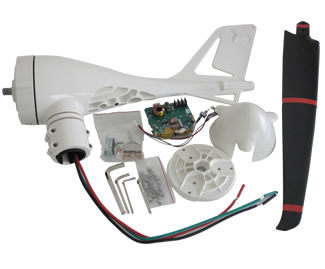 At full battery the wind generator Infiniti 300 is braked automatically, which reduces the attrition extremely and makes the wind turbine extremely long lasting. The easily mounting is made on a pipe with 48 mm outer diameter (eg 1 1 / 2 "water pipe).